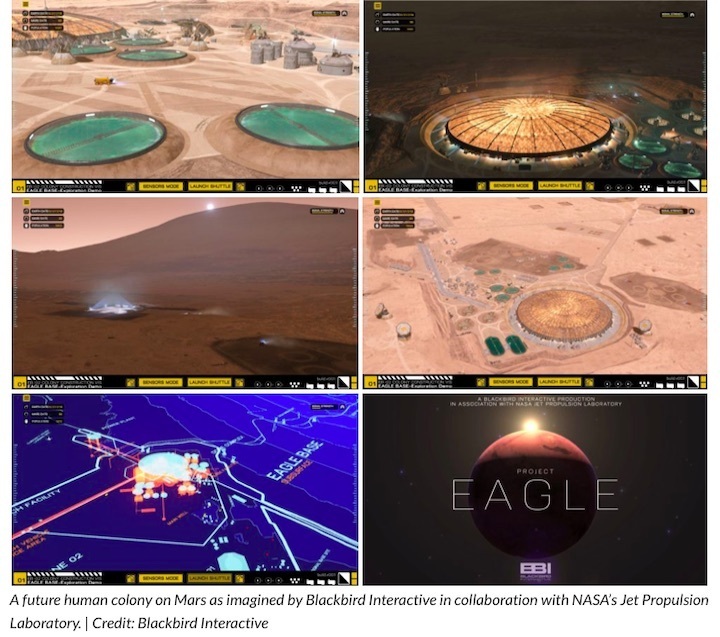 NASA’s Jet Propulsion Laboratory (JPL) collaborated with independent game studio Blackbird Interactive (BBI) to create an incredibly realistic interactive 3D Mars base simulation called Project Eagle. Using current science and potential technology development inspired by it, users can venture through the simulation’s multi-level Eagle Base where “past” and “current” colony construction, energy, and habitation projects are on display with infographics explaining their design and overall functionality. The timeline is set 100 years in the future with a red planet population that starts with around 5500 colonists that are visibly carrying out a life among the regolith. The imagined colony is located in the Gale Crater, an area slightly south of Mars’s equator on the Eastern hemisphere, which is also the same spot NASA’s Mars Curiosity Rover landed on August 6, 2012. In fact, the simulation has a monument set just outside the colony which commemorates Curiosity. The topographical and geographic features are based on actual map data collected by Mars satellites and rovers that were provided to BBI, and through a series of time lapses, users can experience a virtual day, sunsets, nights, and sunrises. This region is also near the Elysium Planitia where NASA’s recently arrived InSight lander is located. While exploring, users will come across a few unique features in the simulation. The primary region is the “Dome Complex” wherein a very large biodome made possible by Mars’s low gravity -the Eagle Dome – is located, providing an Earth-like ecosystem for the colonists. The dome is shielded from radiation, but enough light is allowed to filter through so that occupants don’t suffer from claustrophobia. The environment also enables spacesuit-free living. To support the dome and other areas where colonists are living and working, multiple algae-ponds have been constructed which generate oxygen and provide a supplemental food source. Outside of the dome are condo-blocks providing primary residencies to the planet’s human occupants. These have been constructed using Mars-native materials and connect to a system of underground tunnels, also areas protected from radiation where colonists can live without pressurized suits. To realistically show the progress made in the colonization effort, legacy “hab” pods and an old launch pad are present, complete with little blurbs about the colony’s development history. Additionally, power is provided via nuclear fission reactors, the Uranium for which is provided from Earth every few years on resupply missions. Water treatment facilities connected to Martian water wells are also present along with several satellite dishes forming a communications array where Martian internet has been established. When visitors are ready to leave, a shuttle launch animation is available, sending off a flattened winged craft from a receded launch facility, thereby exiting the simulation. Project Eagle was first introduced in 2017 at the annual D.I.C.E. (Design, Innovate, Communicate, Entertain) Summit hosted by the Academy of Interactive Arts & Sciences. 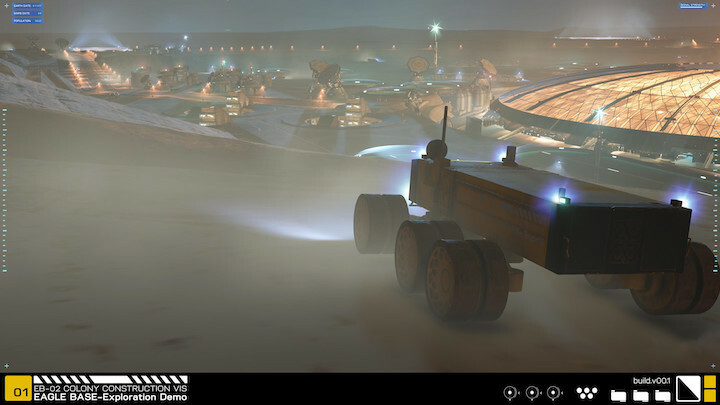 In the presentation hosted by Dr. Jeff Norris, Mission Operations Innovation Lead of NASA’s JPL, video game creators were encouraged to utilize their tools – games – to do more than just entertain and amuse their audience. He made a case for art as inspiration for a plausible vision for the future of space exploration. “Great art doesn’t just move us as individuals – it can move entire societies,” he stated on stage. He further cited the connection between the originator of “space art”, artist Chelsey Bonestell, and the public’s directly inspired support of the later Moon missions. The simulation was made available for use by attendees and is now available through Steam.